I’m Manju and I blog over at https://sewmanju.com/ you can also find me on Instagram @Sewmanju. I was honoured when Sheona reached out to ask me if I would consider doing a guest post for Sewisfaction. I have admired the way that Sheona has worked so hard building the business up and it didn’t take much for me to say yes. 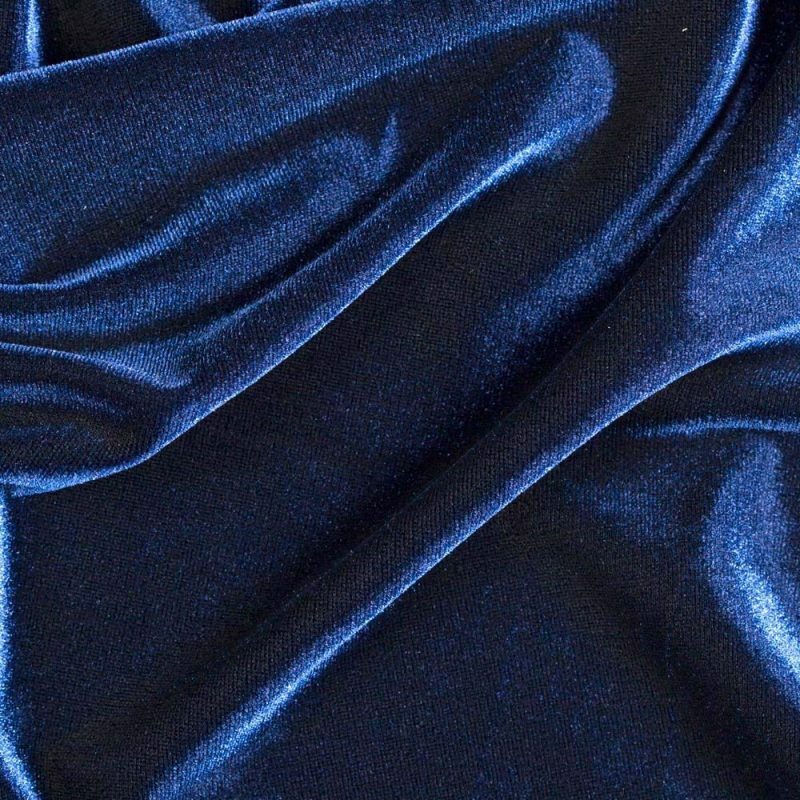 I dithered a fair bit over what to select, but, with Christmas fast approaching, I finally settled on 3 metres of the luxe stretch velvet in navy (but it’s available in 4 other colourways too). This fabric is perfect for sewing a festive-holiday dress. It’s washable, it’s warm and cosy, it’s a perfect weight so skims over any body imperfections, it stretches so is very comfortable and the fabric feels luxurious and rich. I chose to pair my fabric with the Pauline Alice Aldaia dress pattern, which I have made twice before (search my blog to see what modifications I made), but essentially, the only changes made to this version (from the original pattern) were minor: lengthening and slimming down of the sleeves, shortening the neck band by 1.5 inches for a snug, no-gape fit, and lengthening the skirt by 2 inches. Truthfully, I could perhaps have stood to do a very small full bust adjustment (maybe like 0.25 inches), but it’s still a great fit. 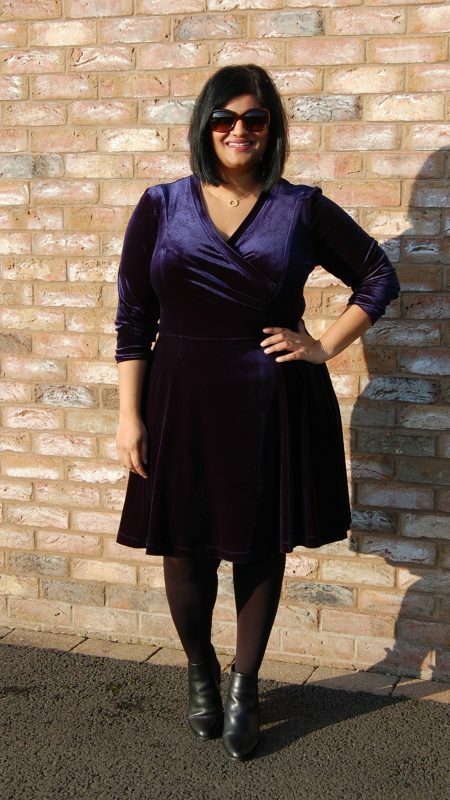 The shape of the skirt panels, coupled with the fact that velvet has a nap which means that all the pieces need to be cut with the nap running in the same direction, means that you will need to order a little extra fabric. I was kind enough to be provided with 3 metres of fabric and to be honest I used almost all of it, because of the directional cutting that was required. Make sure to stabilise the waist. The instructions don’t tell you to do that, and I found on my first version of this dress that the waist stretched out because I omitted that step. That skirt is heavy! I used clear elastic to stabilise and also applied the same to the shoulders. 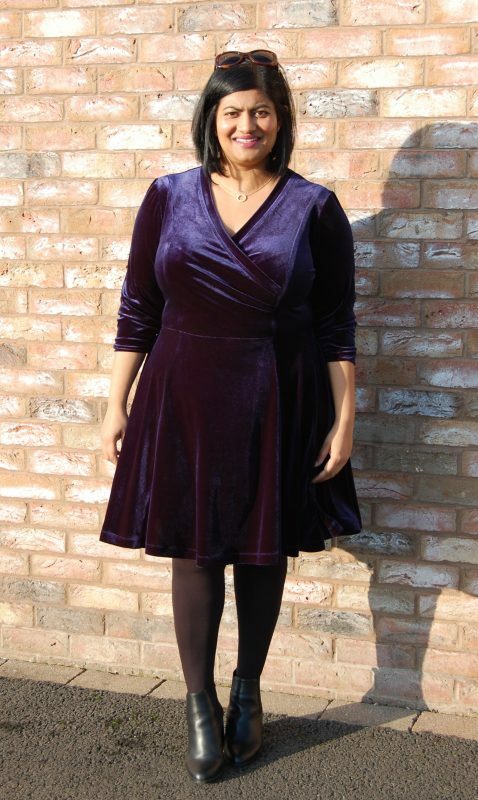 Back to the velvet: this fabric pre-washed, cut, sewed and pressed (with care!) well. I used a medium setting on my iron, steam, and a light hand to press and used my silk organza press cloth to protect the fabric when pressing from the right side. As mentioned above, velvet has a nap and I chose to cut my fabric with the nap running upwards; so that the fabric feels rough when brushed downwards. I found that cutting the fabric in this orientation produced a richer looking dress. 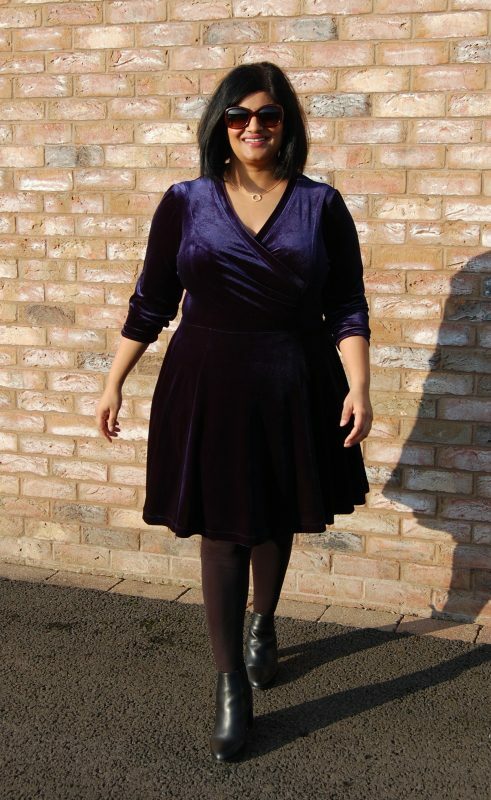 I used a combination of my sewing machine and overlocker to construct this dress. I used my machine for more control over fiddly parts, like basting the neck and sleeve bands in place before overlocking, but just used my overlocker for things like sewing up the skirt panels and setting in the sleeves. On my sewing machine I used my stretch stitch (the one that looks like a lightning bolt) and a universal needle. I used a Schmetz 2.5 stretch twin needle to topstitch the neck band and the hem. I found I needed to topstitch the neckband to stop it from collapsing. I worked on this dress over a period of a week, on and off, but if you had a good stretch of time I reckon you could easily complete it within a day. The pattern is becoming my go-to for knit dresses; I just love all the different options and the neck band gives a beautiful fit and finish. The fixed wrap bodice is flattering, coupled with the flared skirt, and there’s no fear of anything coming untied or undone. In short, I love this dress and it’s made such a welcome addition to my wardrobe.